Our company is highly esteemed name in offering Latex Gloves to the clients. Latex Gloves are manufactured under the supervision of skilled vendors by utilizing high grade material and ultra modern technology as per the set standards and norms. These products are widely demanded in hospitals, clinics and nursing centers. Heavy duty Natural Rubber Gloves in Orange Color. These Gloves are made from Centrifuged Rubber Latex. Gloves are Soft and Flexible, thick palm and strong enough for heavy duty operations. We are highly acknowledged organization engaged in presenting remarkable range of Latex Gloves. We are engaged in offering Sterile Powdered Latex Gloves to our clients. These Sterile Powdered Latex Gloves are made from finer and softer quality raw-material. 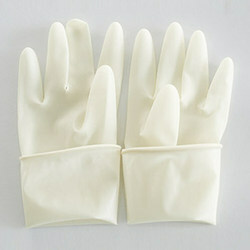 We are into manufacture and export of Latex Gloves. We manufacture Latex Gloves in all standard sizes like S, M, and L. These surgical grade gloves provide total protection from unwanted or dangerous substances. These gloves are exclusively designed for easy donning to help prevent roll back. The beaded cuff of our Latex Gloves makes donning easy. Type: powder-free (on-line chlorinated / polymer-bonded / double chlorination) and non-sterile. material : natural high quality latex. design & features : ambidextrous; smooth or fully textured; beaded cuff; off-white to yellow.